Here you can find a list of affordable hostels and hotels. The DGB Haus is very close to the train stations, so we recommend you to get there by train/ S Bahn from the airport or from within Frankfurt. If you take the south exit, it´s only a five minute walk. Take the A5 in the direction of Frankfurt, Exit Westhafen and then straight on Gutleutstraße until Baseler Platz. Stay on the right (Stuttgarter Str.) 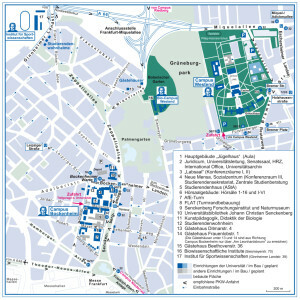 to get to Wilhelm-Leuschner-Str. (Einbahnstr.). There is a parking garage at Baseler Platz. The Festival will take place at several venues, one of them is the Studierendenhaus (Students House), which is located on the Campus Bockenheim of Frankfurt University, located at Mertonstraße 26-28, 60235 Frankfurt/Main. Given that the Action Conference is a European event language is an issue. We will ensure that all plenary sessions are translated from English to German and vice versa. Since this is a self -organized event we kindly ask everybody to think about the language issue for the various workshops. We will help wherever possible so that English and German is provided everywhere. For other languages, we ask for support and self-responsible organization from inside the groups. Hot meals, coffee and tea will be provided by activists on a non-profit basis. However it cannot be distributed totally free, so we ask for a contribution. Please help us with your registration! We need to know beforehand how many people will participate in the conference, how much food is needed, how many people need accommodation. There is a registration form on blockupy.org. The Blockupy alliance is a non-profit, political alliance, it does not have or generate own money, a budget etc. The Festival is being funded solely by donations – from individuals, groups, alliance partners, smart cooperation. However, rooms, printing material, organizing translators does cost money, and we want to support those people from outside of Germany who cannot pay huge amounts for travelling.